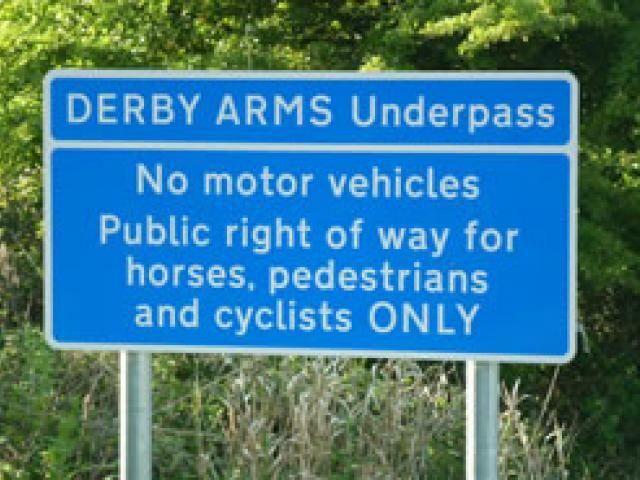 A new sign has been placed at the entrance to the tunnel under the A590 near to the Derby Arms (near Witherslack). The highways sign now forbids cars to use the shortcut under A590 which had been a concern for cyclists in such a narrow tunnel. UPDATE - Nov 2010: Despite the new signing, motorists continue to flout the law and use the tunnel as a shortcut. If you have lights, please use them and do not try to ride past a vehicle in the underpass - there isn't enough room. UPDATE - Apr 2011: As reported recently by the CTC Cumbria County Council's Development Control and Regulation Committee are now expected to install a lockable bollard which can only be opened by farmers, who will be the only ones allowed to drive through the tunnel. Sustrans official view is that whilst they generally prefer to see traffic free routes whenever possible, in this case use of the tunnel as a quiet lane/underpass with low volume and speed of vehicular traffic is quite acceptable for cycling. Please let us know if you encounter any problems using the tunnel.